During the RAC Pilot Project, millions of dollars were reimbursed to the Medicare Program by outpatient rehab providers who had been paid inappropriately. Much of the repayment was due to documentation issues.This session deals with correct documentation, code assignment and billing in order to achieve appropriate reimbursement. 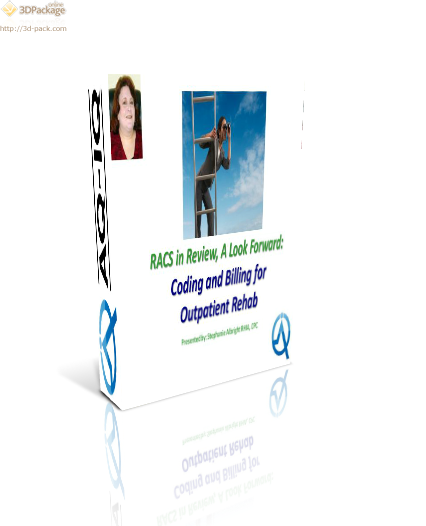 With early attention to detail, the RAC review process can yield more positive results. Review types of therapy services and the professionals who provide those services. Outline of general policies for outpatient therapy services. Other policies concerning therapy services are found in other manuals. When a therapy service policy is specific to a setting, it takes precedence over these general outpatient policies. Overview of therapy coding and billing. Discussion of therapy services relevant to RACs.